Today, we launch a new pricing model. The old “add-ons” model became too complex for our users as Weld’s functionality grew, and we needed to make it simpler. The Free package is still generous, giving you 3 projects (websites/prototypes) with free .SE/.NU domains. The big thing is that you will have the “Made in Weld” watermark at the bottom of your website. 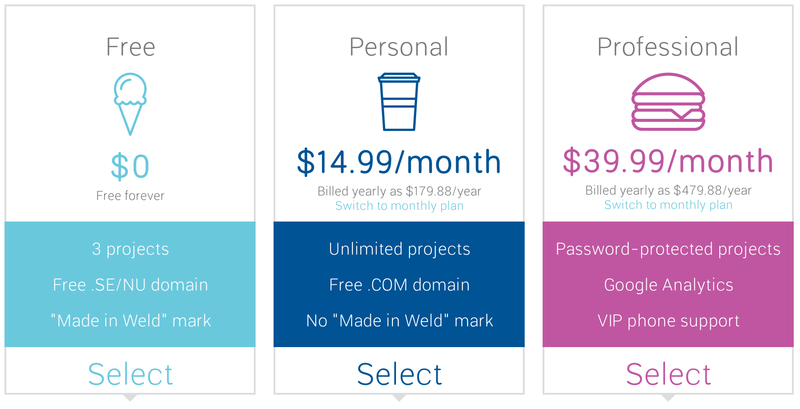 The Personal package costs $14.99/month (if paid yearly, otherwise $19.99/month) is when you want to publish your website without the “Made in Weld” watermark. We give you a .COM domain free of charge! The Professional package is for users who need and demand more. It costs $39.99/month (if paid yearly, otherwise $49.99/month). It gives you VIP support over phone, Google Analytics and password-protection on your projects. If you want to keep your old Weld add-ons, no worries! You can keep them as long as you like. But you can’t buy new add-ons. Check out the packages here and let us know if you have any questions!